A new piece of technology unearthed on Tuesday shows Apple has developed iPhone technology that automatically shuts off texting capabilities when it is determined that a user is driving, helping to mitigate potential accidents resulting from in-car distractions. 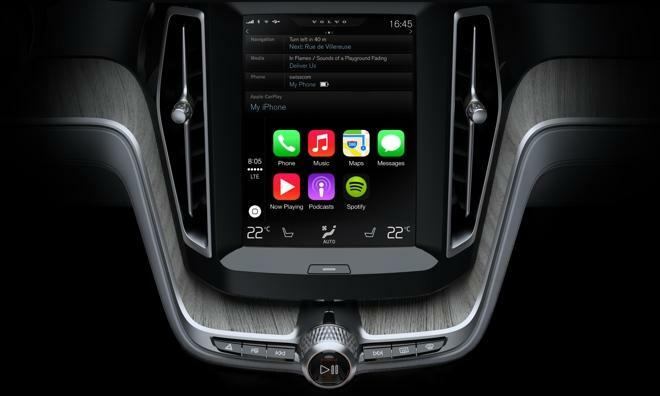 With Apple's automotive projects —Car Play and Siri Eyes Free —rolling out in more vehicles throughout the year, the company has been beefing up its in-car technology suite. A document discovered on Tuesday, however, shows Apple's "iOS in the car" initiatives go back much further than iOS 7. The U.S. Patent and Trademark Office issued Apple U.S. Patent No. 8,706,143 for "Driver handheld computing device lock-out," a system that intelligently determines whether a device user is driving and shuts off distracting phone functions accordingly. There are two main embodiments to Apple's invention. The first concentrates on a lock-out mechanism that requires no input from a vehicle and instead uses on-board sensors to determine when a user is driving. In the second embodiment, the car is able to transmit blocking signals to an iPhone, effectively stopping a user from receiving and sending texts, or using other smartphone functions while in the driver's seat. Without input from the car, an iPhone relies on data from a motion analyzer and a scenery analyzer to trigger a lock-out mechanism. As described, accelerometers, cameras, light sensors, GPS receivers and other sensing components can be deployed to harness raw data. The motion analyzer monitors device speed up to a certain threshold that, when reached, is indicative of a car in motion. Making the system more accurate is data from an iPhone's GPS and accelerometer, which can be used to discern whether a user is walking, running or in a moving motor vehicle. 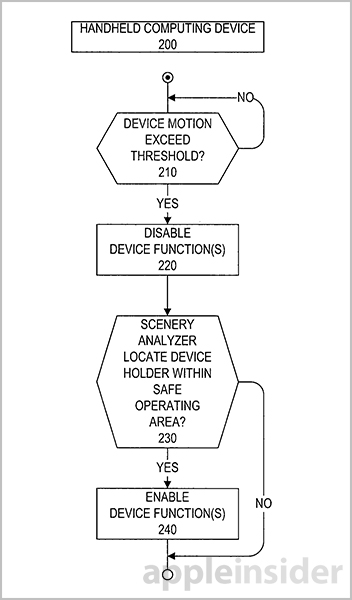 The scenery analyzer is more complicated in that some embodiments require image acquisition and processing to determine when a device holder is in a "safe" or "unsafe" operating area. For example, the analyzer algorithm may find that a user is in the driver's seat by analyzing a photo or video that shows one face and a steering wheel. Alternatively, if the analyzer sees two faces, one in the driver's seat and another in the passenger or rear seat, the device may be classified as in a "safe area." Further, an accelerometer can be used to ensure the person holding the device does not pan away from the driving cockpit to avoid analysis. Once recognition and analysis are complete, the lock-out mechanism may be activated according to preset rules. For example, texting may be blocked when a device holder is found to be driving. The second embodiment is fairly straightforward, with the car in communication with the iPhone via RFID or active radio signals. In this case, onboard sensors, a wireless ignition key or other proximity-sensing devices can communicate a blocking signal to the nearby phone, disabling texting and other distracting features. Another notable function of Apple's invention is a parental lock-out function that disables user-selectable smartphone features associated with a specific key or phone. 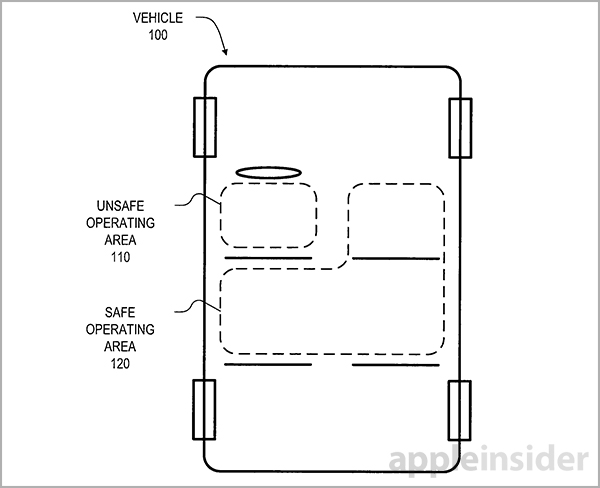 It is unclear if Apple intends to incorporate the lock-out functionality in a future iOS version, though no mention of the feature was made in CarPlay's introduction. As noted in the patent document, however, such a mechanism would be "a significant selling point in the eyes of concerned parents, and it could lead to legislation that would require all handheld computing devices to disable texting while driving." Apple's handheld device lock-out patent was first filed for in 2008 and credits John Greer Elias as its inventor.